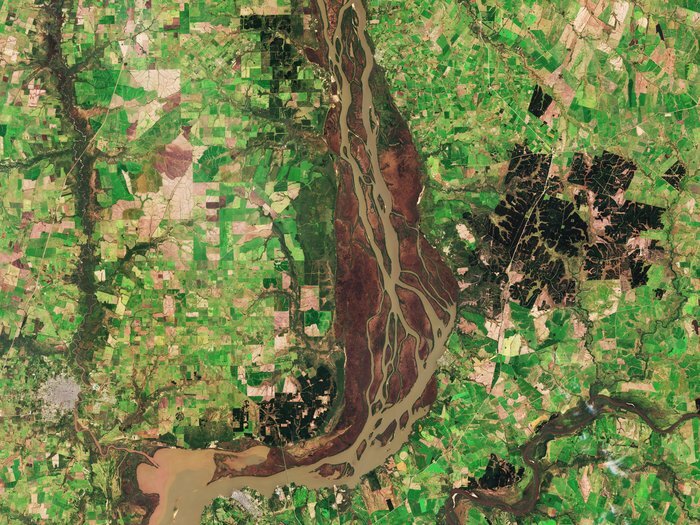 DescriptionThe Copernicus Sentinel-2B satellite takes us along the lower reaches of the brown, sediment-rich Uruguay River. Here, the river forms the border between Argentina and Uruguay and is the site of the Esteros de Farrapos e Islas del Río Uruguay wetlands. This wetland system is home to 130 species of fish, 14 species of amphibian, 104 species of bird – a quarter of all birds found in Uruguay – and 15 species of mammal, including the maned wolf, the largest canid (meaning dog-like) species in South America. Visible to the lower left – its built structures shown in grey-white – is the Argentinian town of Gualeguaychú. On the eastern shore of the Uruguay River is the Uruguayan city of Fray Bentos, an important national harbour, famous for a plant that once exported corned beef around the world. Now inactive, this sprawling industrial complex has become a World Heritage Site. Sentinel-2 is a two-satellite mission to supply the coverage and data delivery needed for Europe’s Copernicus environmental monitoring programme. The mission’s main instrument has 13 spectral bands, and is designed to provide images that can be used to distinguish different types of vegetation and monitor plant growth.